Google's Nexus devices are sold directly from the Google Play Store, unlocked and running the latest version of the Android OS — Android 5.0 Lollipop. The Nexus line consists of four current devices — the Motorola Nexus 6 and LG-made Nexus 5 smartphones, and but a single tablet — the Nexus 9. Nexus 9: The Nexus 9 was announced on Oct. 15, 2014, and represents the first of the new generation of Android hardware. The Nexus 9 is made by HTC and is powered by an NVIDIA Tegra K1 system on a chip. In the LTE-capable model, the off-die modem comes from Qualcomm. The Nexus 9 is the first proper 64-bit device in the Android stable. Price starts at $399 for the 16-gigabyte model. Nexus 6: Also announced on Oct. 15, the Nexus 6 essentially is an oversized second-generation Moto X with new camera software. It's still using a Qualcomm Snapdragon 805 processor, so no 64-bit goodness for this guy. The Nexus 6 launched with major carrier support in the United States, until now unheard of for the Nexus line. That also means it's subject to the usual carrier subsidies, and gone is the lower price you'd get for an unlocked model directly from Google. Nexus Player: While Chromecast ushered in the era of streaming from Android to TV — or, rather, using your phone or tablet to have the connected Chromecast device stream content on its own — Nexus Player scales things up a bit. The $99 box (a flat circle, really) serves as a Chromecast while also offering a "leanback" experience for any number of streaming services, including YouTube, Google Play, Hulu and the like, plus it's an Android gaming console, with an option $39 controller. Nexus 5: The fifth Nexus smartphone, launched on Oct. 31, 2013 along with Android 4.4 KitKat and made by LG. The N5 was priced at $349 in the U.S. for a device with a 5-inch 1080p display and a Snapdragon 800 CPU with 2GB of RAM. It's also got an 8-megapixel rear camera with Google's novel "HDR+" camera, and a 2300mAh non-removable battery. The Nexus 5 supports 4G LTE in North America and the rest of the world across two models, the D820 and D821. Check out our review for more on the Nexus 5. Nexus 7 (2013): The second-generation 7-inch Nexus tablet, manufactured by ASUS. Compared to the 2012 original, the 2013 Nexus 7 sports a higher-resolution display at 1920x1200 pixels, a thinner chassis and faster CPU — a quad-core Snapdragon S4 Pro with 2GB of RAM. The Nexus 7 launched at $220 in the U.S. for the 16GB Wifi model, with more expensive 32GB and LTE-connected models also available. We've got more on the 2013 Nexus 7 in our full review. Nexus 10: Released in late 2012 alongside the Nexus 4, the Samsung Nexus 10 remains the current 10-inch tablet offering from Google. It comes with 16 or 32GB of storage and a high-resolution 2560x1600-resolution display and a dual-core Samsung Exynos 5 CPU. As of early 2014 it's been updated from Android 4.2 Jelly Bean, which it shipped with, to the latest version, 4.4 KitKat. For our take on the Nexus 10 when it launched in November 2012, check out our review. The Nexus 4, made by LG and released in November 2012 with prices starting at $299 for the 8GB version. It ran Android 4.2 Jelly Bean out of the box, and has since been updated to version 4.4. It's got a 4.7-inch 1280x786-resolution display and a Snapdragon S4 Pro quad-core CPU with 2GB of RAM, and was available globally as a HSPA+ (42Mbps) device until mid-2013. The Galaxy Nexus, released in late 2011 with Android 4.0 Ice Cream Sandwich, was the last Nexus phone made by Samsung. For much of its life it was exclusive to Verizon in the U.S. Elsewhere a HSPA+ version was sold with a slightly smaller battery and slimmer chassis. In mid-2012 this unlocked version was sold through the Google Play Store in the U.S. The Gnex, as it's sometimes called, was updated to Android 4.3 Jelly Bean, but not the newer 4.4 KitKat. The 2012 Nexus 7, the first Nexus tablet. Manufactured by ASUS, this device made waves due to its low price point — $199 for the 8GB model — and relatively high specs for the time. It included an NVIDIA Tegra 3 quad-core CPU, 1GB of RAM and a 1280x800 display. Later a version with HSPA+ cellular data was made available for an additional markup. The Nexus Q, Google's ill-fated streaming orb. The Q was announced at the Google I/O 2012 developer conference, where 5,000 of the spheres were given to attendees. However due to its high price ($300) and limited functionality (it could only stream stuff from Google's ecosystem) the Nexus Q never saw widespread release. Those who pre-ordered were shipped a Q free of charge, and it was eventually replaced by the Chromecast dongle in 2013. The Samsung Nexus S, released in late 2010, showcased Android 2.3 Gingerbread. Only the second Nexus handset to launch, its hardware was based upon Samsung's original Galaxy S. It was also the first Android phone with NFC, a new feature in Gingerbread. A Sprint version with Wimax data, the Nexus S 4G, emerged in mid-2011. The Nexus One, the original Nexus sold by Google online, made by HTC and released in early 2010. With a 1GHz CPU, a high-res (for the time) display and Android 2.1 Eclair preloaded, the N1 established the combination of vanilla Android, timely updates and high-end hardware for which the Nexus line has become known. The latest Android security patch, July 2018, is now rolling out to Google's Pixel and Nexus devices. 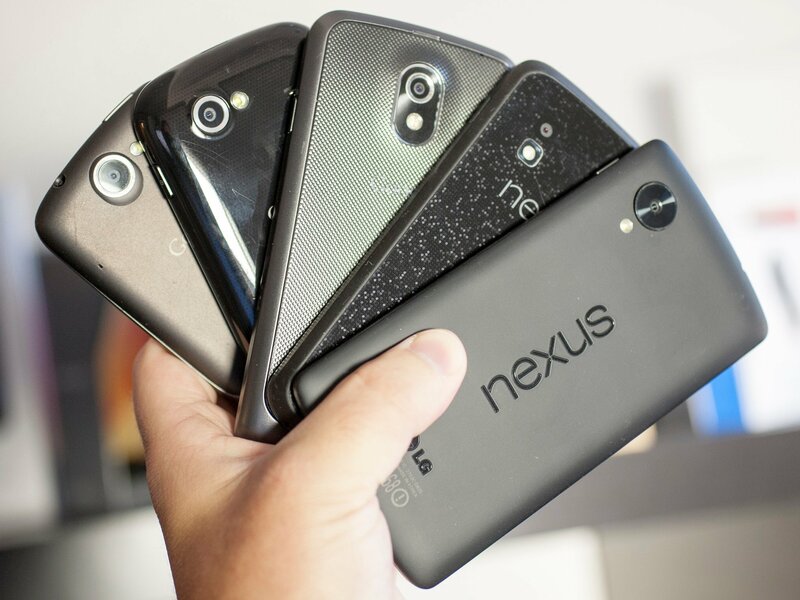 We don't know what the P stands for just yet, but it means goodbye to the last Nexus phones. Security patches and feature fixes are on the way for Google's phones. DIY-ers can do it today, OTA files expected shortly. October 31, 2017 marks the fourth birthday of the Nexus 5's release, so we decided to take a look back at just what made the phone so awesome. Return it to the repairman who replaced your battery and explain the problem. The sooner you do it the better the outcome. Good luck and please let us know the outcome. It’s been two full years since Google released the Nexus 6P, the final entry in the celebrated Nexus brand. With a brand new Google device landing in stores, there's no better time than now to upgrade from Nexus to Pixel. Now that the Pixel 2 is here, is it time for Nexus 5X owners to consider upgrading to Google's new hardware? Is metal really a better material than plastic on phones? The smartphone industry is all about metal and glass designs as of late, but these flashier materials lose something we once had with plastic-clad devices. Google has updated its 'Minimum update & support period' to show an extra couple of months for the Nexus 6P and 5X. Seriously, no Inline images in email on Android? This topic still ranks high in Google Search: so, this is to let know the unhappy ones that Nine email (paid) supports inline images with its Rich Text editor.